An artwork inspired by the 2008 Presidential Election will be on display at the Art Museum of the Americas in Washington DC as part of the Bilateral Engagement exhibition curated by my good friend Laura Roulet. Hesh thenset the benches in a dozen prominent local locations and asked people passing by what they were for or against. The results were over 1000 written opinions and 306 photographic portraits of everyday people captioned with what they are for or against. Whether they voiced a personal issue, or one on the world stage, people seemed eager to have this forum for expression. 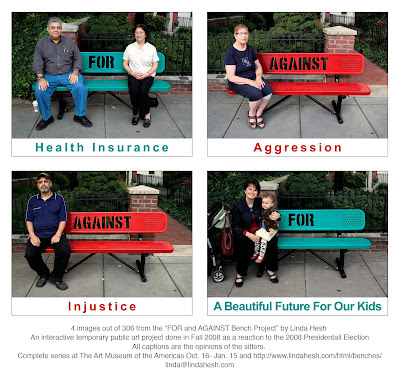 The complete “FOR and AGAINST Bench Project” including benches, written opinions, and 306 portraits as a video will be on display as part of the “Bilateral Engagement” exhibition at the Art Museum of the Americas from October 16, 2009 until January 15, 2010. The exhibition consists of artists selected by curator Laura Roulet from the Washington Sculptors Group paired with the concurrent Latin American artists. The DC Commission on the Arts and Humanities has a special grant that funds artists and arts organizations serving seniors, 60 and older in arts programs.